With add-on installed, you can quickly check the best prices from 20,000+ merchants on the top 30 bookselling websites with just a click of your mouse. While iPads, Kindles, and Nooks are grabbing headlines, for the 97% of readers who only buy paper-bound books, there is now a much faster, easier, and better way to save money buying books online. 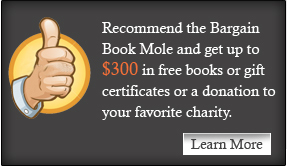 www.BargainBookMole.org has just released free browser add-ons for Firefox and Internet Explorer. What makes these “next generation” shopping add-ons different is that they let buyers search for the best book prices on the web exactly when they want to: on the fly, anywhere online while reading details about a book. Of course, price isn’t everything. The Bargain Book Mole also lets readers review the details of a book’s condition without having to visit the site where the book is sold. In short, the Bargain Book Mole is the fastest, most convenient, and best way to buy the best-priced books online. It’s easy to understand why before its official release date and with no publicity, the Bargain Book Mole is already receiving the most downloads of any Firefox book-buying add-on. - The initial download of a Bargain Book Mole add-on only takes seconds, but for the first use requires restarting your browser.